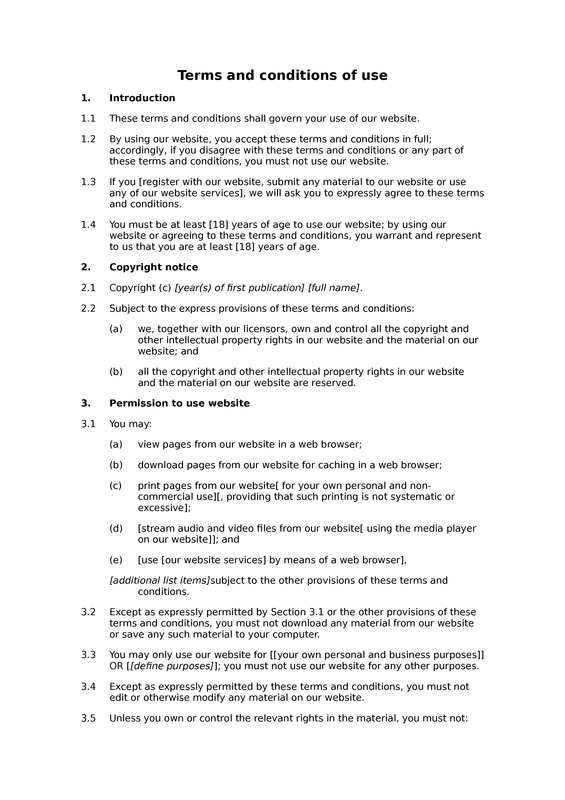 This template combines the provisions of our terms and conditions templates for directory websites, social networking websites, affiliate websites and advertising websites. 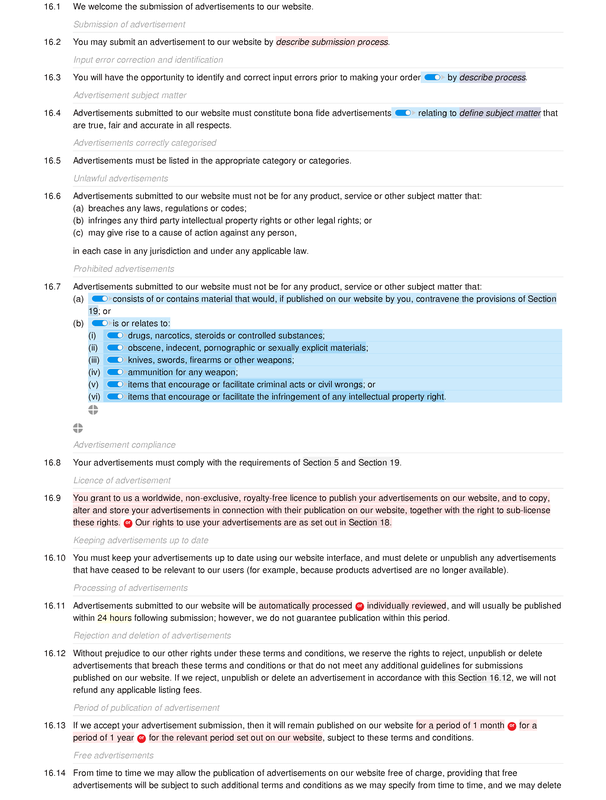 The provisions relating to directories cover both free directory entries and those for which a person seeking a listing must pay - although it is a straightforward matter to omit either the free listing provisions or the paid listing provisions. 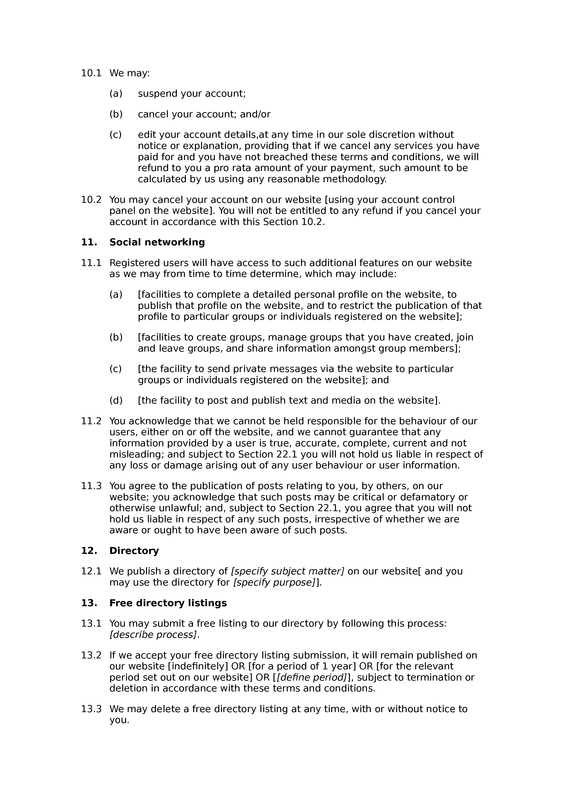 The social networking provisions assume that social functionality is free to use. The section covering affiliates is designed to cover hyperlinks to merchant websites that are published on the website, where the website operator will earn commission or some other financial benefit if users click on those links and then go on to make a purchase or take some other defined action. 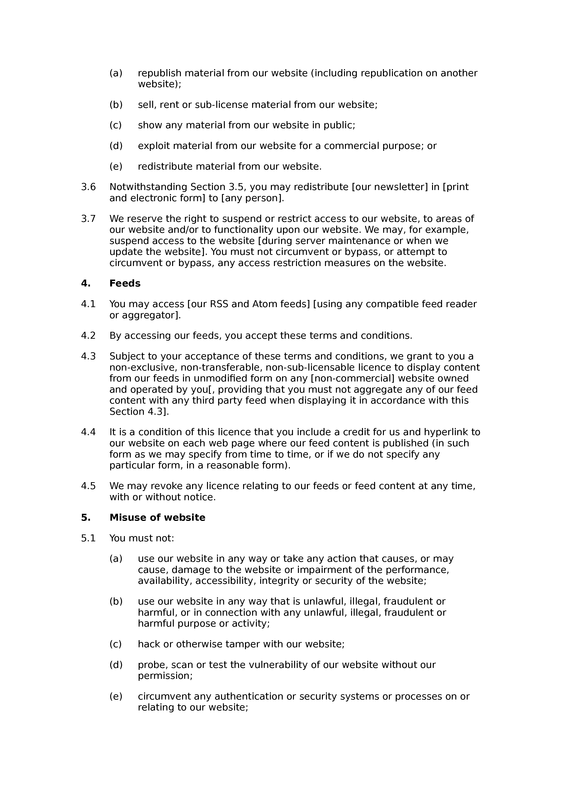 The advertising provisions are designed to cover the publication of advertisements on the website (e.g. banner ads) in exchange for the payment of fees. Acceptable use: acceptable use: prohibitions; veracity of information supplied. 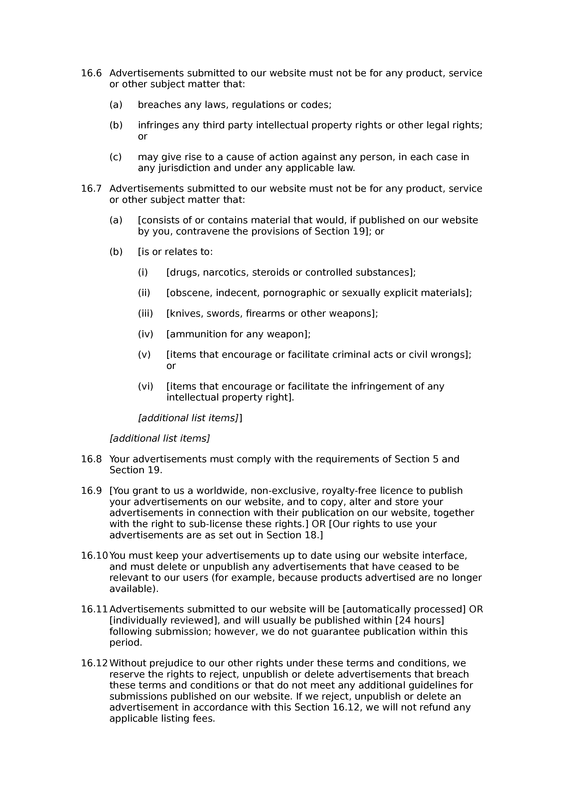 Affiliate links: website includes affiliate links; affiliate fees; user acknowledgements regarding merchants; no obligation to mediate or enforce contract with third party; provision subject to limitations of liability. Use on behalf of organisation: use on behalf of another. 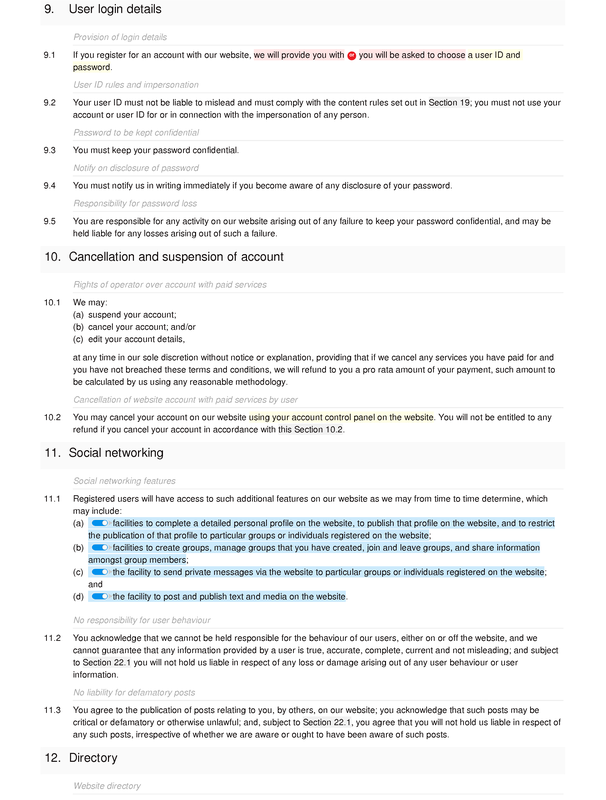 Cancellation and suspension of account: rights of operator over account with paid services; cancellation of website account with paid services by user. 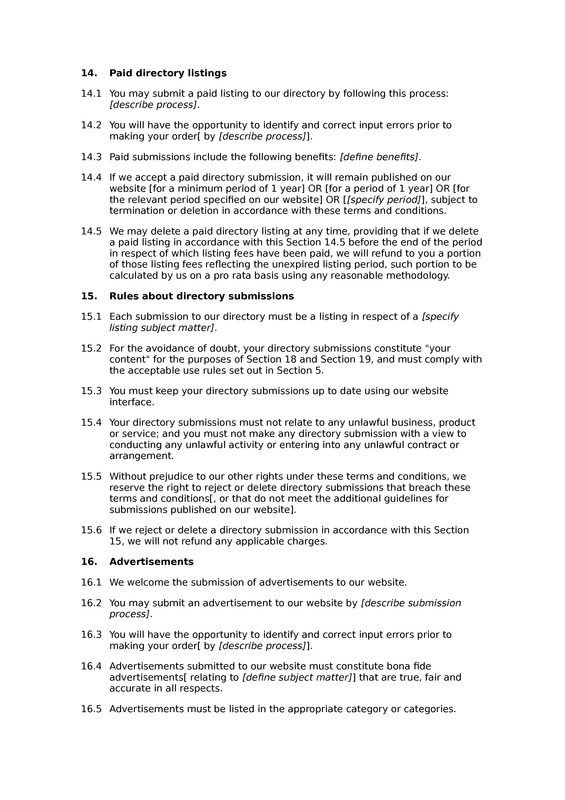 Directory: directory submissions welcome; directory submissions positive rules; directory submissions compliance with acceptable use etc; keeping directory submission up to date. Free directory listings: free directory listing submission process; free directory listing period; deletion of free listings. 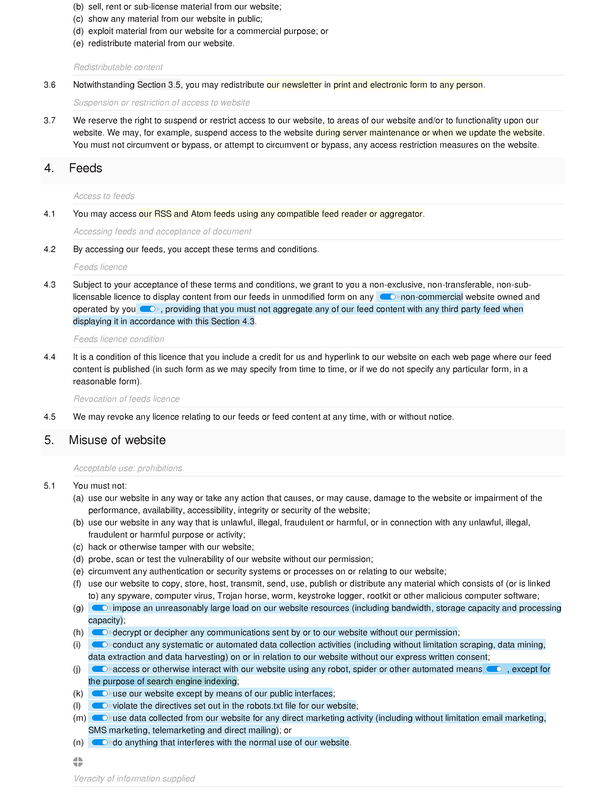 Paid directory listings: paid directory listing submission process; input error correction and identification; benefits of paid submissions; paid directory listing period; deletion of paid listings. 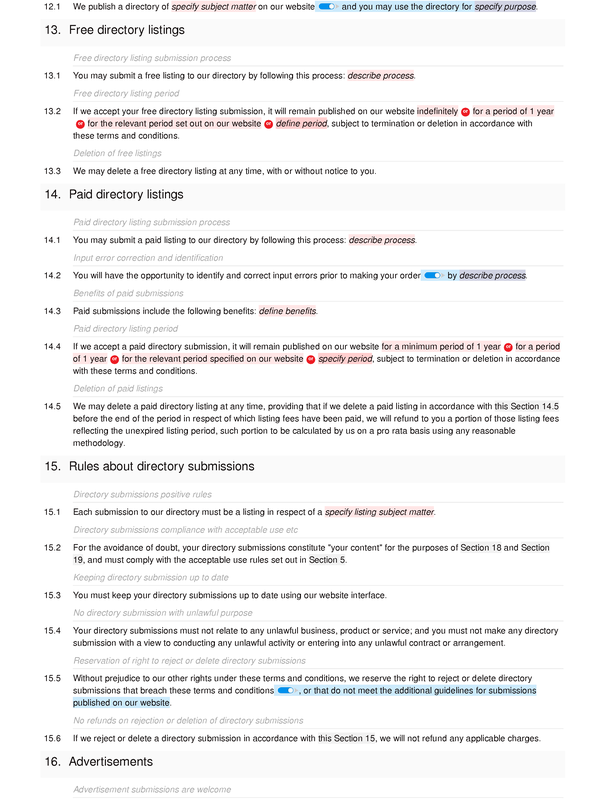 Prohibited directory submissions: reservation of right to reject or delete directory submissions; no refunds on rejection or deletion of directory submissions. Advertisements: advertisement submissions are welcome; submission of advertisement; input error correction and identification; advertisement subject matter; advertisements correctly categorised; unlawful advertisements; prohibited advertisements; advertisement compliance; licence of advertisement; keeping advertisements up to date; processing of advertisements; rejection and deletion of advertisements; period of publication of advertisement; free advertisements. 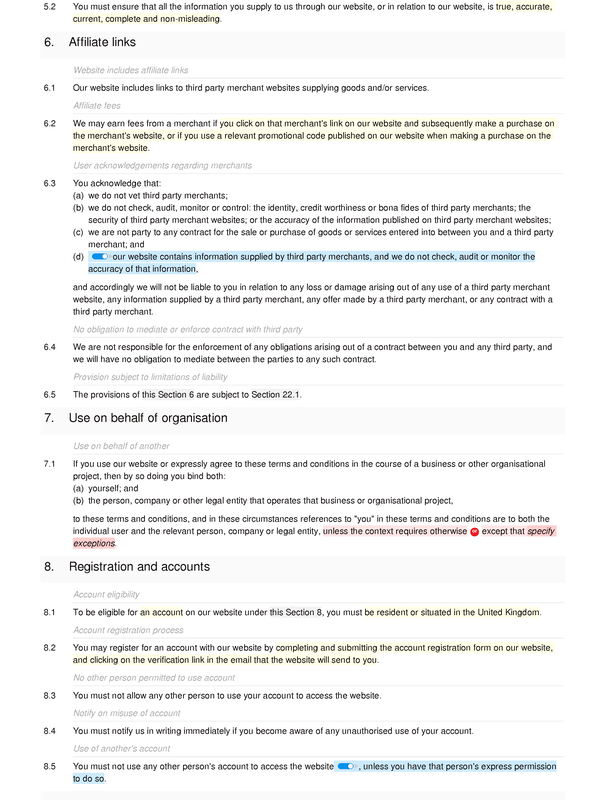 Fees: fees specified on website; amounts inclusive or exclusive of VAT; payment of fees; variation of fees; disputed payments; unjustified charge-backs; unpaid fees: withdrawal of services; right of set off. Limitations and exclusions of liability: caveats to limits of liability; interpretation of limits of liability; no liablity for free information or services; no liability for force majeure; no liability for business losses; no liability for loss of data or software; no liability for consequential loss; no personal liability; liability cap upon services contract. 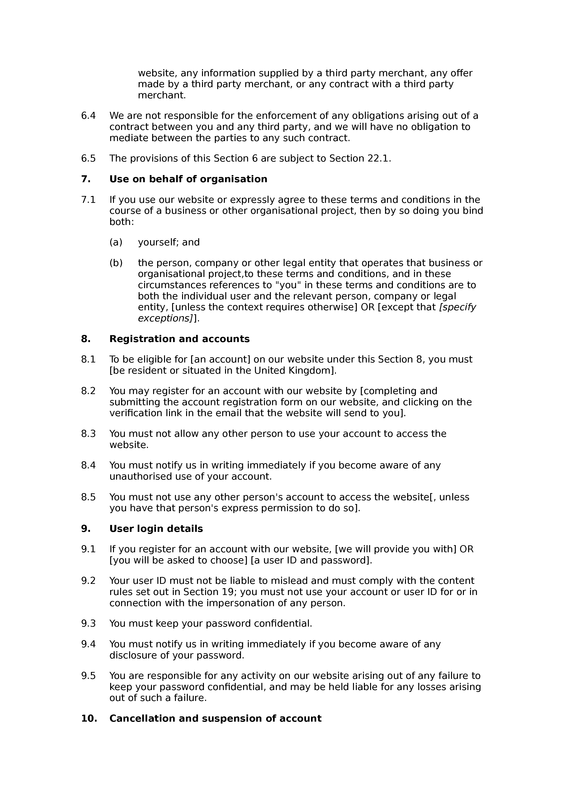 Statutory and regulatory disclosures: copy of document not filed; language of document; ecommerce regulations: trade register; ecommerce regulations: authorisation scheme; ecommerce regulations: professionals; ecommerce regulations: code of conduct; value added tax number; link to ODR website; name and URL of ADR provider.